If you've exhausted the possibilities of Dog & Wabbit Wocks, had a play at Blue Tongue Boulders and maybe even ticked a route or two at Scorpions, then its time to venture forth into the realm of the Rabbit. Rabbit Rocks is perhaps one of Mt Alexander's less frequented climbing destinations. I'd like to say it's the hidden pearl, the secret wonderland of local crags, but alas it's not. It offers one outstanding route; Mosquito 17m, grade 15. And the rest are average even by Mt Alexander standards. Never-the-less there might be something there that tickles your fancy and there is also a nearby quarry (not in the VCC published guide) offering 3 or 4 short but reasonably exciting routes. Access is via the road (see the guide book for details) up from Harcourt either hiking down from Wabbit Wocks, or walking along the private road to the Granite works site. I'll describe the later approach because its easier to illustrate exactly where things are in words, however to avoid trespassing on private property consult the VCC guide for the correct approch. Park at the locked gate (pictured above right), and faintly labelled "Laviton Granite", just off Coopers Road. You're on private property from this point onwards, at least until you get to Rabbit Rocks itself, so bear that in mind and check the guide book for restrictions. As you walk along the shaded road beyond the gate, you'll shortly come to a right bend. Immediately on your left you'll see the old abandoned quarry. (I assume it's abandoned, though it does have a slightly haunted feel). There's a footpad running through what used to be a small orchard, which leads to the far back wall of the quarry. Here you'll find 3 or 4 interesting routes (pictured left, and below right). Again, I must stress that this is private property. I'll leave it up you to investigate access restrictions. The rock in the quarry is, as expected, carved up and somewhat loose in places, so bear that in mind, especially when leading. The route in the centre of the block (pictured above left), is really quite a fun climb and probably the pick of the quarry lines. To it's right an open book corner is an easier tick. Above Left: Back wall of the old quarry. On the pictured face there are two good routes; the open book corner, and the crack in the centre with the horizontal break about 3/4rds of the way up. Trad gear required, though from memory I believe there is a belay bolt on the top somewhere. Just around the left side of the block another couple of lines present themselves. The obvious lack back corner on sharp square edges (pictured right), and the very strenuous hand jam crack in the centre with a very difficult top out which you might skip. The jamming is a consistent width (see hand jam picture above) all the way up and there is little or no foot holds, thus requiring foot-jams as well - a delight if jamming is your speciality. Above Right: The super strenuous hand jam crack in the centre, and the sharp lay back corner to it's left. Note, if you intend to top rope these climbs, or belay from above, you might want to bring a long a few metres of static so you can lasso something (like a big tree) a little more confidence inspiring than that single belay bolt, if it's still there. Also note, the climbs mentioned go over huge, fully detached and fractured blocks of granite, that's obviously been machined out of the countryside. It's possible the whole thing could come crashing down. As always, assess the situation and climb at your own risk. 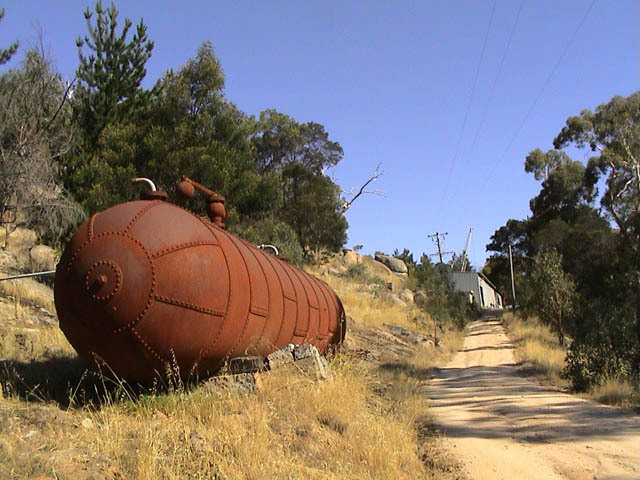 To get to Rabbit Rocks boulders simply continue down the road in from the gate (pictured top of page) until you get to a big rusty old contraption (pictured left). If you were to continue up the road you'd get to an active granite works site from which the banshee call of rock saws can oft be heard - don't go there. At the rusty cylinder (pictured left) you have two options. If you hike up hill, left of the road you'll be heading straight for Rabbit Rocks. Unfortunately this, I assume, is very definitely private property. You might be better off instead leaving the road on the right side and working your way around the granite works site in a big arc or U-turn to eventually arrive on the high side of the sheds. To do this, head right, cross a dry creek bed, avoid the brambles, turn left at the fence and head up the nice track, then turn left again as you clear the granite works site, cross the creek bed once more, and eventually work your way up hill onto the slope directly above the sheds. You'll need to be about a football field away from those sheds. Here you'll find Rabbit Rocks. The longer alternative but correct approach (which avoids private property) is to have hiked down from Wabbit Wocks. Consult the VCC guide for directions and a map. The pick of the climbs at Rabbit Rocks is, without a doubt, Mosquito 17m, grade 15 (pictured right). It looks hard from the ground, with the rock peeled smoothly back from the crack foiling an easy lack-back ascent. But once you're on it, the moves just fall into place and small cams sew up the line. A fun climb! 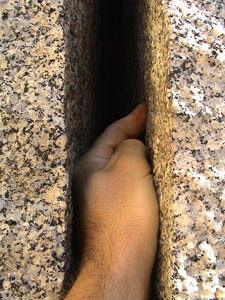 Right: Mosquito 17m, grade 15 takes the finger crack in the centre of the boulder. Left: Crows Nest Wall. Cockroach takes the loose jumble of flakes in the centre. Once you've ticked Mosquito, you'll be searching for something equally as fun. Unfortunately there isn't much else on par with it. Immediately to the right of Mosquito is another boulder, Crows Nest Wall, containing a couple of very short routes that are worth doing, given that you've walked all this way. Cockroach, 9m, grade 9 might serve as a warm up. There's also a short hairline crack on its left that goes at grade 20. Around the other side of Mosquito there's an off-width crack maybe worth a look if that's your cup of tea (not graded). However, moving further along in that direction you'll find "Cicada Outcrop" (pictured below right). This would have been a good block, but it's broken by a large ledge, making what lines there are short and interrupted. Right: Cicada Outcrop. Left: Wormwood Boulder. 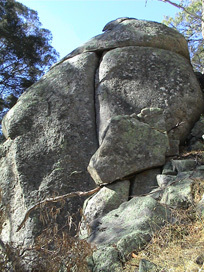 Moving a few metres further again, and you'll come to Wormwood Boulder (pictured left). The rock has a little bit of height to it (15m), and its eroded features have a certain aesthetic appeal. Abandoned Quarry 3 or 4 routes on the back wall ~18 ?